While September 16th was a moderately busy day, with many Swainson’s Thrushes and Grey-cheeked Thrushes heard calling first thing in the morning and a diverse group of warbler species seen in the netting area, the 17th saw Pelee Island drenched by thunderstorms. Sumiko braved the elements to conduct the daily census, and saw only three warblers: a Common Yellowthroat, a Blackpoll Warbler, and an American Redstart. After the rain, Sharp-Shinned Hawks and Merlins were seen daily around Fox Pond and in the netting area. Their presence had an inhibiting effect on the thrushes and warblers, who kept a low profile to avoid becoming a morning snack. Blackpoll Warblers and Swainson’s Thrushes continued to predominate, with occasional sightings and captures of Veerys, Black-Throated Blue Warblers, and Magnolia Warblers. By the 19th, bird activity had slowed considerably. Only 12 birds were banded on the 20th, all of them thrushes. Some entertainment was provided by the Blue Jays who have begun to form large, raucous flocks as they prepare to migrate across the lake. Much of Blue Jay migration remains a mystery: less than 20% of the population migrates in a given year, and some birds who migrate one year stick around as residents for the next. On September 24th, the north winds we (and the birds) were waiting for finally arrived! The banding station was busy all morning, with 117 birds banded of 20 different species, most of them warblers. Most unusually, the number of warblers captured was greater than the number of thrushes captured: 27 Magnolia Warblers, 12 American Redstarts and 9 Black-and-White Warblers were banded, among others. The first Blue-Headed Vireo, Brown Creeper and Golden-Crowned Kinglet of the season were captured as well. The influx of warblers didn’t last long: by the next day, the wind had shifted to the east and once again Swainson’s Thrushes and Grey-Cheeked Thrushes dominated the daily totals. 41 birds of eleven species were captured, and while there were still a few warblers around (such as a beautiful adult male Common Yellowthroat), they were noticeably less common. Rain on the last few days of the month, along with strong south-west winds, slowed bird activity down considerably. The only ones who seemed at all comfortable with the inclement weather were, of course, the gulls, Double-Crested Cormorants and American White Pelicans who crowded Fish Point. Several hundred Ring-Billed Gulls were observed on the 26th, facing into the wind and preening as they waited out the rain, with a single Caspian Tern (noticeable because of its bright red-orange bill) tucked in among them. Nets were open for just a couple of hours first thing in the morning on the 27th – enough time to capture a hatch-year Eastern Screech Owl (grey phase). It perched resentfully on the banding station, glowering at us with its ear-tufts upraised, before flying off with a shiny new band. PIBO had an interesting encounter on September 27th. 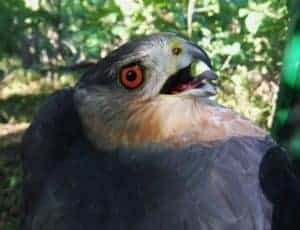 A banded adult male Cooper’s Hawk was captured and the information sent to us by the banding office revealed that he had been banded on September 23rd, 2013 by PIBO’s own Graeme Gibson! The hawk was a second-year bird in 2013, which means that he is now four years old. He looked very healthy, and hopefully PIBO will see him again in future years – maybe even in 2019!